The Hayden Library is host to an interactive exhibition from September 7th. Patrons will be able to play a selection of videogames adapting literary works, from Shakespeare to Douglas Adams. The exhibit is an exploration of the range of approaches to adapting novels or plays to a videogame format, from creating worlds based on the works of a single author, to free interpretations of a novel. The result is often whimsical, turning the worlds of these stories into spaces to be explored, often abstracting them into videogame conventions. The games featured in the exhibit invite players to become Nick Carraway, the narrator of The Great Gatsby, dodging drunken partygoers in his way to meet Gatsby, explore the world of Shakespeare's plays, carry out an exercise of introspection based on Sophocles' Oedipus at Colonus, or revisit the events of The Hitchhiker's Guide to the Galaxy. Our own game, Yet One Word, is also part of the show. The games have been curated by the Clara Fernández-Vara, a member of this lab, and Nick Montfort, Associate Professor at MIT. Preparing the exhibit, both the process of curation and setting up, has been an unusual challenge, given the venue and the nature of the exhibit. 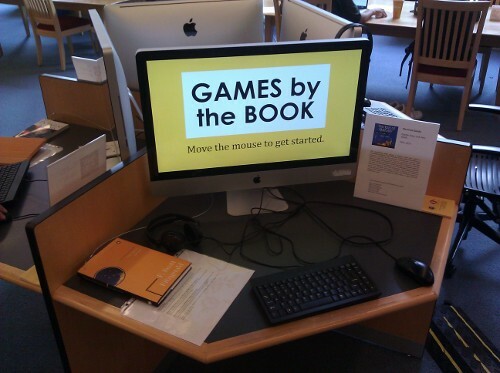 Games by the Book will be open to the public until October 8th, and will be located on the second floor of the Hayden Library building. More details can be found in the exhibit's website. The exhibit is sponsored by the De Florez Fund for Humor and the MIT Council of the Arts. The organizers are the MIT Game Lab, the Electronic Literature Organization and Comparative Media Studies.